This summer, Crayola is encouraging children to let their imaginations run wild with a nationwide wellness campaign called the “Crayola Outdoor Challenge.” The initiative is aimed at inspiring families to spend more time outside exercising their bodies and minds. We are all about linking arms with organizations and other mamas to help inspire families to spend more time outdoors and being active. So, this giveaway is meant to inspire some time outside! To coincide with National Physical Fitness & Sports Month, Crayola is asking families to take the “Crayola Outdoor Challenge” and pledge time each day this summer to outdoor creative play – which can reduce stress, build confidence and reinforce creative thinking skills. The national goal is to reach one million hours of pledged outdoor play time. Beginning May 5 and running through the end of the summer, parents can take the pledge at Crayola.com and find dozens of outdoor games and activities that keep kids’ imaginations and bodies active. Getting creative outdoors lets kids make their own fun and when their imaginations are involved, the fun is endless. To provide families with even more ways to get outside and have fun, Crayola has introduced new additions to its line of outdoor products. 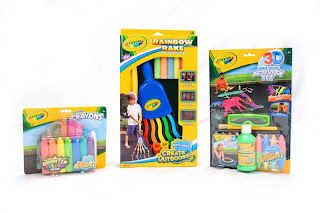 In these challenging economic times, Crayola’s outdoor products provide parents with an inexpensive way to keep their kids entertained and active this summer. "What is your favorite outdoor activity to do as a family?" · Sidewalk Crayons offer kids more than pretty pastels to create outdoor masterpieces. Once reserved for bringing coloring books to life, this new technology offers the richest, brightest, boldest colors for creating extraordinary outdoor artwork. The difference is striking, as the smooth, creamy colors lay down on driveways and sidewalks with unmatched brightness. For children 4 and up, suggested retail price is $4.99 for a set of 15 colors. · The Rainbow Rake is a fun new way to create chalk messages and designs! Kids can adjust the arms for close lines or far-apart lines; use the rake to write giant messages and draw swirling, swooping lines! For children 4 and up, suggested retail price is $11.99 for one rake and 5 pieces of chalk. · Kids can watch their art come to life with the 3D Jungle Safari Activity Set. Create a jungle safari, put on the 3D glasses and kids will feel like they are in the jungle! The set includes 1 bottle of sidewalk paint (7 fl. oz. ), a paint brush, 1 pair of 3D glasses, 8 dual-ended sidewalk chalk sticks, 4 giant stencils and 1 how-to book. For children 6 and up, the suggested retail price is $13.99. Email us in the next 2 weeks to claim your prize. Keep checking back for more giveaways!! You can bet that having three boys and no girls, our outdoor activities almost always involve either dirt or sports. We love to get the 4-wheeler out and ride trails through the woods. We often stop to look and collect different or unique rocks. If we aren't on the 4-wheeler, we are playing football, baseball, blowing bubbles or playing freeze tag. I do love all of the new outdoor products offered by Crayola. I'm happy that there's more to life than just chalk. Gardening! my hub brought the seedlings home last night and my little boy was so excited that they started planting in the DARK! In the evenings in the summer we love to go down to the creek near our house and hang out and throw rocks into the water. I live on a bullhead (reverse culdasack) and I love to walk around our little circle. It has definitely morphed over the last 4 years, I used to push a stroller, then I had a child pushing her own stroller next to me, now she peddles like crazy while her younger sister and i meander. It's so nice to take 5 minutes and make a loop. My favorite is when my husband calls on his way home from work (getting home early that day) and says, "Pack you and the little one into the car, and meet me at the park!" Those warm evening moments, catching up with my hubby and watching my child enjoy her favorite activity, park play, are blessings! Since we bought our three year old a tee ball set, that has been our main outdoor activity, although our kites come in at a close second but are less available(park). He and our two year old can hit and hit and hit at that poor little ball a million times and never miss a squeal of excitement. Our favorite outdoor activity is going to the beach! We dig in the sand and play surf in the water. We love going in the afternoon and staying till the sun goes down. Happy Summer! Jumping on the trampoline... hiking/picnicing... camping... biking... dinosaur hunting are some favorite outdoor activities. We are planning to reintroduce a Friday night tradition. We used to go to the store & buy some fried chicken and sides for dinner. We'd take all of it over to the beach and just hang out. We'd sit and talk until the mosquitos threatened to carry us off one by one. Since it is finally warming up here, we will be starting this again. Otherwise, playing Star Wars in the yard is great fun! We have so many! Hopscotch, backyard obstacle courses, swinging contests, races, gardening together, walks in the park, fishing, and many more! I put your giveaway on Digg! I also am an email subscriber to your blog! Also, I am a member/fan of your Facebook Page! Since we don't have a yard right now, our favorite outdoor activity is going for a nature hike. There is a plethora of beautiful, trailed nature centers near our house. It's fun to watch the frogs in the ponds, see what's blooming, look for butterflies, etc. Our favorite outdoor thing to do as a family is go to the local campground and enjoy the great outdoors. We go swimming, take nature walks, play at the playground, and listen to the live bands. We like to metal detect and go fishing. Thanks for the chance. Our favorite activities are going on "nature hunts" through our local park and we also like to go camping. Thanks- we just ran out of our sidewalk chalk this week! I am a happy subscriber to the weekly update-thanks! We love going to the park or pool / beach. along the way. Thank you! We love to go to the zoo. I'm subscribed to the mailing list (under a different e-mail address, though). We have 2 really big discs (like soft frisbees) that our kids love to toss, chase and catch. Each night without fail we toss these around and it usually ends up with random neighbors joining in. But who doesn't need more outdoor goodness? As a family we like to go for walks together. We put our 2-year-old and 5-month-old in strollers, hook the leash on our big yellow lab and head out to see where our stroll leads us. Often we stop at a playground or park and burn off a little extra energy, but it's nice just to spend time together outside now that it's gotten warm out! We spend as much time outside riding bikes and using our scooter as we can. Our favorite outdoor activities at the moment is blowing bubbles and playing hopscotch. I took the pledge! I pledged and our favorite outdoor activity is riding bikes, playing baksetball and my daughter and I love to play hopscotch together. We (my husband & I and our 4 & 2 year old girls), like to play soccer in the yard and garden. I love seeing the girls enjoy something that made me happy growing up and to see them learning about how things grow. We like to take walks and garden. Thanks! I'm part of your FB network. We like yard games. Like badminton, volley ball, tether ball. We play croquet and boccie ball. Basketball. Trampoline etc. Plus anything that tears the grass up. It just depends, we have a large extended family with little one, teens, adults and our elders. So horse shoes could be going on in one area while a fierce soccer game death match is elsewhere. I'm on the Mama Memo mailing list.